Coriander seed oil There is 1 product. 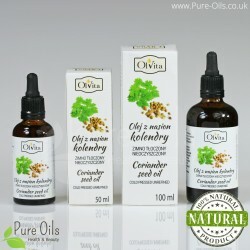 Coriander seed oil is a 100% natural product. It is a cold-pressing and crude product obtained by pressing the highest quality coriander seeds. Thanks to this method this oil has a high nutritional value. Coriander seed oil is mainly a source of monounsaturated fatty acids (80%), as well as flavonoids, plant sterols and vitamin E.